Any Washington DC person might recognize some contradictions here. How 'fine evenings' in August are all relative and even seldom experienced amid the downpours of late. But it was Eclipse Day so perhaps the gods were being merciful sending a breeze and later a delicious fan-shaped pink and blue sunset. Then, too, who dares suggest a 'cruise' on one of the country's most reviled and, until recently, most polluted rivers - cursed as it is, too, by its reputation as a demographic dividing line. The Native Americans named the river but had nothing to do with that unfortunate sequence. Modern economic forces did. Anacostia is renowned as the 'poor side of town,' its residents perpetually struggling to be accorded their fair share of the city's wealth and services. Until recently, the word itself was more beautiful than the river that borders the District of Columbia on the west. Now, according to biologist guide Trey Shepard, a reappraisal is taking place, in slow motion, along the waterway. 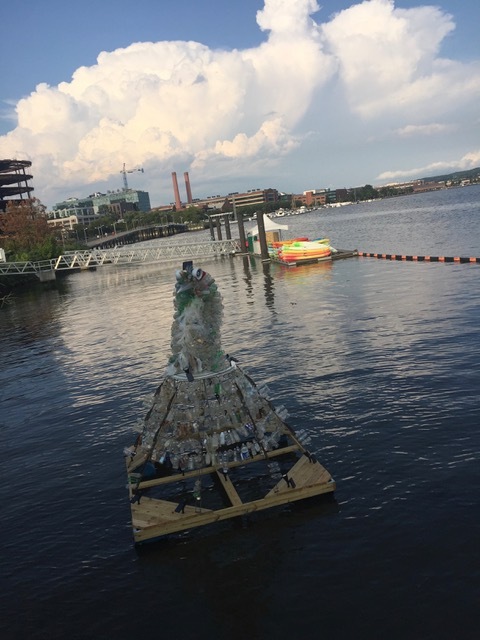 Climb aboard a free boat tour hosted most of the year by nonprofit Anacostia Riverkeepers to see changes and learn about nature's adaptability in the face of humankind's destructibility (largely the form of toxins). One of the most surprising facts: it's possible, except after heavy storms, to swim in the river again without danger and, second, the DC 'tax' on plastic bags in retail stores that underwrites the tours is working. More funds are being collected at the same time that fewer plastic bags are being discarded. Trey is a reliable walking/talking wealth of information about urban water issues and their effect on everyday life in burgeoning DC. He drowns his passengers with information but doesn't forget to point out the wild rice growing on one patch and. eagles flying overhead. That helps - somewhat - the miserable fact that, in the past, one an a half billion gallons of untreated water flowed into the Anacostia each year. The brown color is natural on this tidal vista that stretches for seven miles through DC territory but becoming more and more clean. (Odd but interesting fact: DC's 69 square miles contains two parks larger than New York's Central Park.) Check out www.anacostiariverkeeper.org. 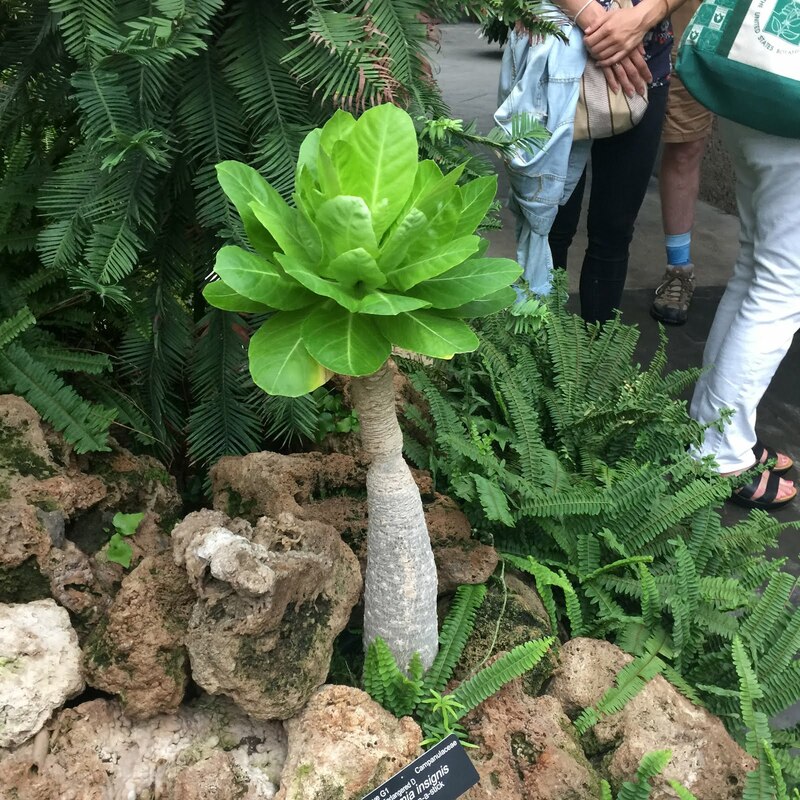 Get a whiff of this: the Corpse Flower (yes, that's the name) exploding in all its glory for the first time in several years at Washington's U.S. Botanic Garden (an arm of Congress, dedicated to the natural as opposed to the political life). Unusual, too: Three Corpse flowers taking their own sweet slow time before these plants, native to Sumatra, unfold green and violet winglike outer covering (a spathe) to show the world just who is boss. Note: The botanical specimen is really hundreds of little flowers making up what the professionals call its 'inflorescence.' Along with the explosion of color comes an intimidating scent that is compared to rotting meat. Ah, go ahead, give it a try. It's free. So is the joke that, well, something 'smells' in the capital city. Be it ever thus. One difficulty is the plant's ornery nature: it makes up its own mind when to perform and it does so without much of a warning. Reputably as many as 20,000 people came by the building in a single day one year to gaze at(and whiff) the eruption. Explanation: The huge size of the bloom (think man size and even higher) needs years - decades even - to store up enough energy to show its stuff. Think lily with a giant ego, in human terms. The smell is what attracts pollinators, such as carrion beetles and flies.